If, like us, you constantly prod your desk or a nearby white wall in the hope that one day it will magically transform into a touchscreen device, then Ubi is what you have been waiting for. 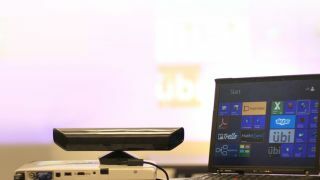 Created by Seattle startup Ubi Interactive, and originally announced back in August 2012, Ubi's software uses Kinect to turn any surface into a touchscreen device and has been officially released. Microsoft has given its blessing to the technology, partnering with the company, which hopes that this level of hands-on interactivity will give a much-needed boost to your average PowerPoint presentation. For the software to work, you will need to link up a projector and Kinect to any PC and the Ubi software will then calibrate your environment and let you get touchy feely. In a blog post CEO of Ubi, Anup Chathoth, explained: "By making it possible to turn any surface into a touch screen, we eliminate the need for screen hardware and thereby reduce the cost and extend the possibilities of enabling interactive displays in places where they were not previously feasible – such as on walls in public spaces. "Our technology has implications of revolutionising the way people live their lives on a global level." The technology may well revolutionise but it also has to undo the years of work parents put in telling their children that touching any surface with mucky fingers is a very bad thing, regardless of the new-fangled Kinect-toting technology that is beamed on to said surface. If you want to try out Ubi, then prices start from $149 – this will give you a 45-inch surface to prod at.